Brighton striker Will Hoskins has been ruled out for the rest of the season with knee ligament damage. The 26-year-old suffered the injury, which may require surgery, in the 1-1 draw with Blackburn Rovers on Tuesday. Hoskins made 12 appearances for the Seagulls this season, scoring one goal - which came against Newcastle United in the FA Cup. The former Rotherham United trainee joined Albion from Bristol Rovers in the summer of 2011. 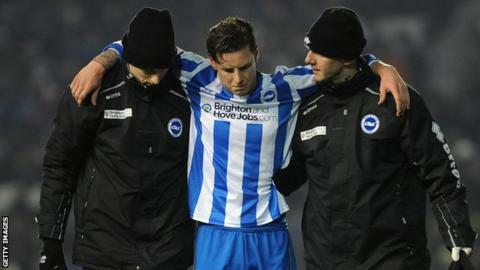 Brighton midfielder Dean Hammond said the playing squad would support Hoskins through his recovery. "Hosko has been working so hard and got his opportunity against Blackburn," Hammond told BBC Sussex. "He is a great player and deserved his chance. He has not had the luck so all the lads and I feel very sorry for him. "We will be there for him if he needs our support."